LDT luminaries designed for applicatoins where superior color rendering and performance are needed combined with subtle soft indirect elements. With 50,000 hours of life at L70 standard and a 5-year limited warranty the fixture maintenance cost is reduced substantially over time. Die-formed 20-gauge steel. Housing embossed for maximum rigidity. Positive latching mechanism. High performance LED platform delivers main beam focus through the optically designed diffusing panel. Sloping high transmission diffuser panels manage contrast and generate soft, even, higher angle luminance. 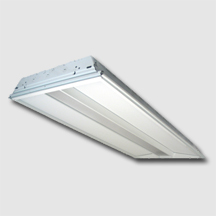 Linear arrayed LED modules provide diffuse, but effective illumination. Long life LED’s and high efficiency drivers work together to provide superior performance in an efficient package to deliver optimal performance. LED’s available in 3000K, 4000K and 5000K with a CRI >84. Electronic drivers are available in 120/277 volt applications. 0-10V dimming as well as 50% step dimming capabilities available upon request. When in the step dimming 50% position the 0-10V leads may still be utilized for further dimming control.